Just look at this beauty in a bowl! I am so, so excited for this coming week and our Cinco de Mayo feast. Tacos, guacamole, tequila and now… fruit salsa. If you’ve been following the blog for a while, you’ll know that fruit salsa and I had a MOMENT. I probably have about ten (plus!) 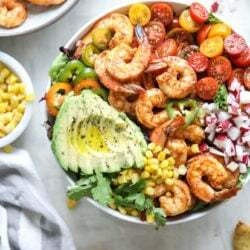 recipes for different kinds of fruit salsa here on the site because I’m such a lover of the sweet and savory. Not to mention all the ones in my cookbook. Eddie is also a huge fan of it and it’s rare that we have taco night without some version of homemade salsa with fruit in it. I’ve partnered with Tostitos for this post because for a limited time, they are offering a Cantina Thin and Crispy Sopapilla chip. YES! SOPAPILLA. This is the best excuse ever to have a great big party for Cinco de Mayo with your friends, right? When they first heard about the flavor, I was like… are you kidding me?! Cinnamon sugar tortilla chips? Hello. Yes. Please. Now. I neeeeed them. The amazing news? With one bite of these, I was pleasantly surprised that they are NOT super sweet. I was worried about the sweetness, especially with a fruit salsa because it could be too much sweet and not enough savory. But these are absolute perfection. Still thin and crispy, a touch of that savory flavor, but a light coating of cinnamon sugar. Our usual favorite Tostitos chips are the Cantina Thin and Crispy, so if you’re not a cinnamon sugar person, those ones are TOPS. I love that both chips work with any fruit salsas. I cannot get enough. It totally depends on my mood, which one I’m feeling. And if I’m not going to chop up my own produce for a homemade salsa (hello, kitchen reno! ), we love the Tostitos restaurant style salsa. All the chips please. Forever. Also P.S., you guys can piñata yourself! How cute is that? I can’t even take it. So the passionfruit! How cute are these guys? 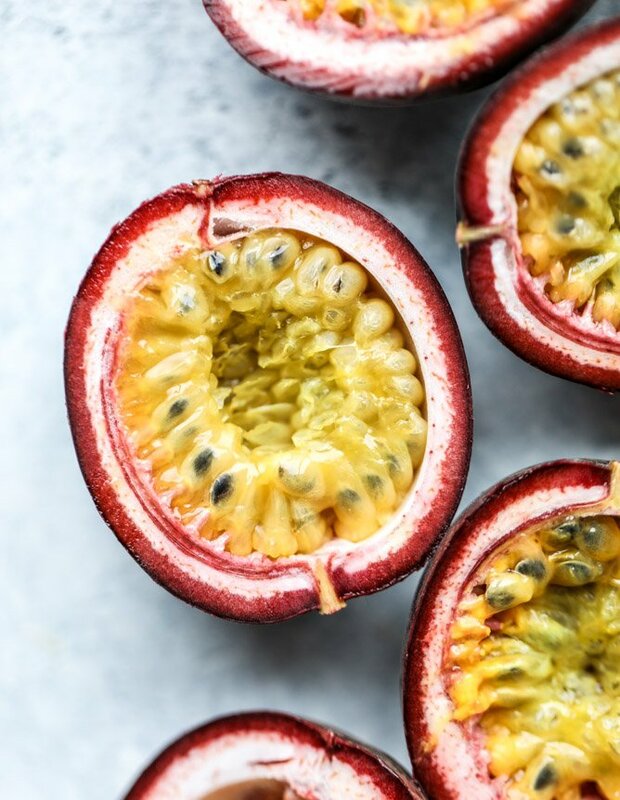 I’m so in love with using passionfruit because it’s a bit tart – but also sweet! For this reason, I figured it would be ideal in a fruit salsa. Of which my two favorites went in: strawberries and mango. Some diced sweet onion and jalapeño to balance it out, of course. But you will definitely not mind eating this with a spoon. While you can serve this in a huge bowl for dipping, I loved the idea of making mini portioned cups in hollowed-out Campari tomatoes! Or for a more portable (but unfortunately unedible) version, use the scraped passionfruit halves and serve it in there. Mini salsa cups with chips! I’m in. Combine all ingredients in a bowl and stir to combine. Taste and season additionally if desired. I love this salsa once it sits for 30 minutes or so – the flavors marry together and it’s delicious! If desired, you can scoop the salsa into the empty passionfruit halves or inside Campari tomatoes! These are cute single serve portions that you can serve on a plate with a few chips! Plus, all the margaritas of course! I love passionfruit and this looks just incredible. This will be a fantastic summer salsa. I love fruit salsas! Passion fruit is such a great idea! um, i can’t even right now. passion fruit is my FAVORITE EVER & putting it in a salsa is something i never would have thought of. dying.over.this. This looks so refreshing! I need to try this soon! What a great recipe, Jessica! :-) I’ve never thought of using passion fruit for a salsa. What an awesome idea! I NEEEEEED those chips in my life! 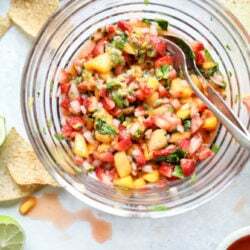 And this fruity salsa would be perfect with the chips! LOVE.